What a gorgeous first weekend for us to spend in Florida. 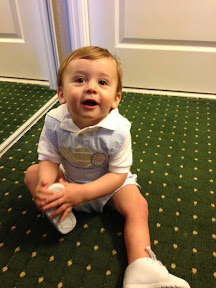 Each holiday (actually each day) gets more fun as James grows up. 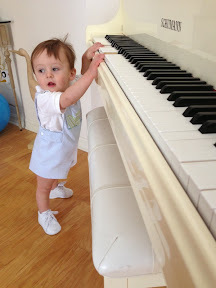 For all the money we've spent at striderite, James started standing and taking his first assisted steps in his Easter white high tops. He loves these shoes and cries to hold them when I take them off him. Who knew? 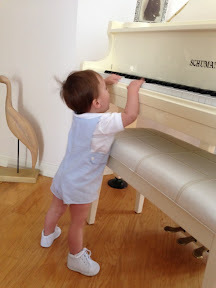 He also loves playing grandmas piano. 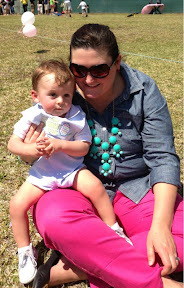 On Saturday we all went to the Egg Hunt at the country club in our new neighborhood. 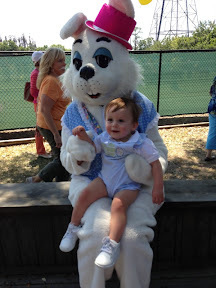 James loved the Easter Bunny. We are buying a house in the same neighborhood where Josh grew up, and like to joke about having grandma and grandpa's club account already memorized! 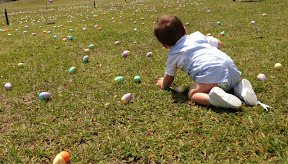 I let James practice hunting eggs before the actual event started. Even though the sections were divided by age, we didn't think he stood a chance of getting any when the hunt began. 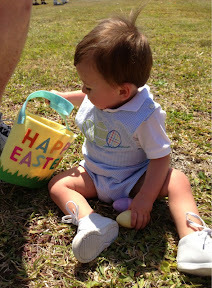 We were pleasantly surprised at his egg hunting abilities, he held his own in the 5 and under group! Checking out his prizes with daddy. 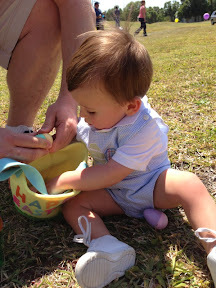 He's a fan of Easter egg hunts, I think he loved seeing all the other kids the most. Despite being tired, he would NOT take a nap. He finally 'napped' at 5:30, Josh and I took the opportunity of a sleeping baby at his grandparents house to go out to dinner to the neighborhood sushi restaurant- it was pretty amazing. 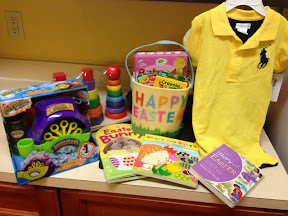 Sunday morning brought Easter Basket goodness. 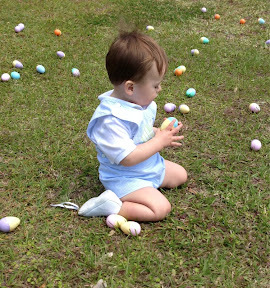 We've been reading his Easter books for the past month or so. Haven't learned to buy batteries when buying toys yet. I bought extra bubble solution, but we still can't experience our bubble hurricane just yet. The real reason for this weekend is the celebration of the gift of eternal life Jesus gave to all of us. Never before have I been more grateful for his sacrifices. We visited a new satellite campus of one of the larger churches on this side of town. This was their first Sunday open and the facility was just minutes outside of our new neighborhood. I loved the pastor and the message, but I must be one of the few who prefers hymns on Sunday morning instead of a rock concert. While I do want to find a close neighborhood church, I may be willing to make the 30 minute drive to the church I went to and love in South Tampa. We finished our afternoon with a visit from my parents and Molly. 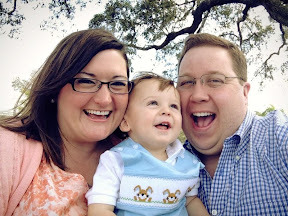 We had a great time together even though the Gators lost in the elite 8 to Michigan. James managed to spill an entire sippy cup if water on himself, guess he's ready for swim lessons to start on Tuesday! It took 7 days, but James finally took a nap in the right place (his crib, not the car) at the right time (12:30). I'm writing this on Monday at 1:30 and listening to him jibber jabber in his crib and not sleep- after a wrong place (car seat) wrong time (11) cat nap this morning. Agh! I will get us back on schedule some day! 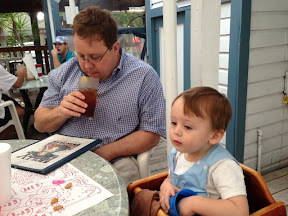 Dinner was great at one of our favorite beachy restaurants. It feels good to be home. Yay! Yesterday was such a beautiful day here. What part of town did you guys settle on? 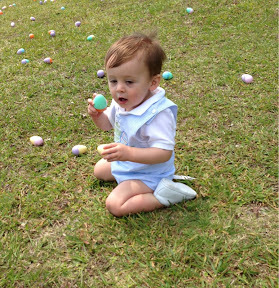 Glad you had a great Easter-He is risen! I felt the same way about Sunday morning rock concerts, but I've grown to enjoy the more contemporary music as well. My heart opened to the message at the church, not necessarily the delivery! Glad you are back, now when are we getting together? !